Lose yourself and wander through any of the nine bars and soak up the ambience on all four levels. The show stopping rooftop bar with sweeping treetop views is a must see and the perfect backdrop to Australia’s biggest hotel. If you enjoy a beer, the Eatons Hill Hotel has over a hundred taps with all your favourites chilled exactly how you like them. Now that is variety! With 9 bars under one roof, Eatons Hill Hotel has plenty of variety for punters. Its biggest and most popular drinking station, the Main Bar is home to live music and good times! Kick back and relax around the Main Bar with an adjoining lounge in full view of the famous Fig Tree. The Main Bar has something for everyone; boasting an extensive range of local, premium and imported beers, a well-rounded wine list, and enticing cocktails. 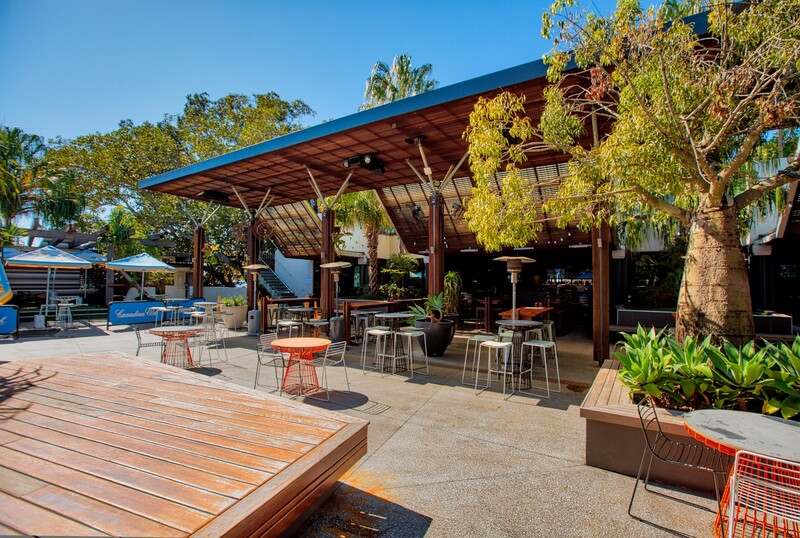 The Eatons Hill Hotel Beer garden is home to live music and major sporting events on the MEGA SCREEN! It’s the Northside’s ultimate open-aired beer garden designed for you to kick back and relax. You can be sure that all live sporting games will be up in lights and on the mega screen – the next best thing to being there. After being inducted into the Hall of Fame for winning Queensland’s Best Entertainment Venue 3 years in a row, the Nightclub is home to the best local, national and international acts. If you like to party then Eatons Hill Hotel’s Nightclub is the only destination you need to know. No act is too big with a long list of International Acts showing the Nightclub stage who is boss. The Nightclub is open Friday and Saturday nights to give Brisbane its weekly dose of great live music. All new machines have been installed in the luxuriously styled gaming room; plush furnishings and detailing, bigger and better than ever before! Punters will be lost in the depths of flashing lights and the sophisticated ambiance. The designated entrance makes finding Gaming easier and is positioned at the forefront of the Eatons Hill Hotel venue entrances. State-of-the-art, high volume air-conditioning systems are also installed. Eatons Hill Rewards – Every time you play the gaming machines with your loyalty card inserted you will earn Player Rewards Bonus Points that can be used to purchase Hotel products or be exchanged for cash through our player’s kiosk, located in the gaming room. Membership to Player Rewards is free. Eatons Hill Hotel supports responsible gambling. The contents of this web section are not intended for minors or excluded patrons.